but from one mother we both draw our breath. Ceylon, Sri Lanka from 1972, is an astonishingly beautiful island in the Indian Ocean about 20 miles or 32 kilometres off the southeastern coast of India whose capital city is Colombo. It was a Portuguese colony from 1505 to 1658, and Dutch colony from 1658 until Holland ceded it to Britain in 1798. With a population of 17 million Ceylon has some six distinct groups of people, but the Sinhalese make up three-quarters of the number. In 1948 Ceylon gained independence from Britain. The Union of Burma and Ceylon are kindred spirits for they embrace the religion of Buddha. This religious bond brought the Burmese Prime Minister for a State visit in 1949. At the farewell banquet his hosts asked what could they offer in memory of his successful visit. This gave the astute Thakin Nu an opening that was dear to his heart. Would the Government of Ceylon allow Burmese Buddhist to worship in the presence of a sacred tooth of the Lord Buddha? The relic had not left Ceylon for more than 2000 years! 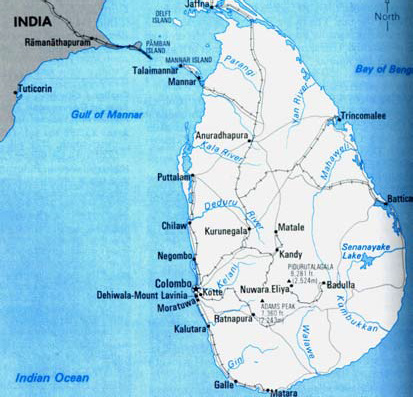 Map of Ceylon which became Sri Lanka in 1972. Glorious land steeped in religion. 4 March 1950, Mergui Burma. Dove XY-ABQ swamped by devotees welcoming the relic. 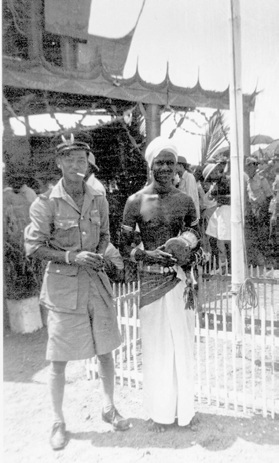 In early March 1950 a British cruiser left Ceylon carrying the Tooth and its guardians. The night before the 4 March the phone wakened me and I was told my trip on the morrow was to fly the relic to Mergui in lower Burma. The Company had placed its faith, its reputation, and the priceless relic in my hands. The day dawned, and with my valuable cargo aboard I pointed my Dove at the azure sky. My radio officer Steve Monteiro advised Mingaladon radio that we were leaving the coast at 3,500 feet. Ahead stretched the usually restless Gulf of Martaban, which today it seemed in a benign mood. I held the Gulf of Martaban in some awe as strange things had happened there. 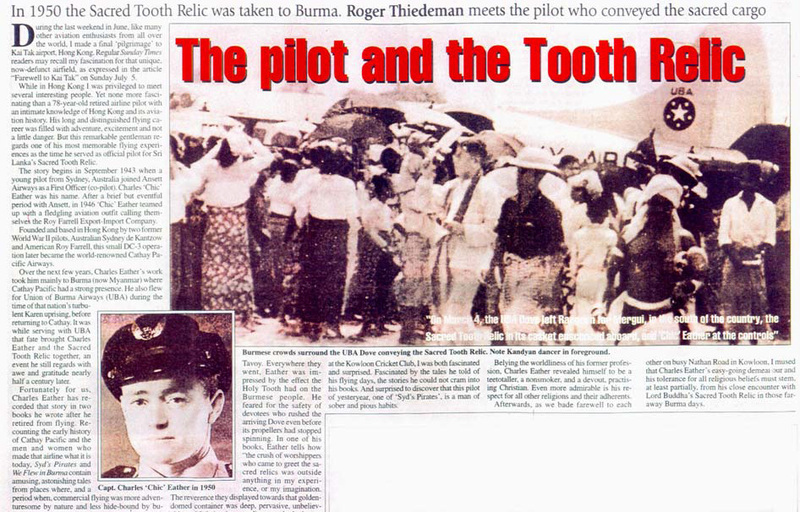 Many pilots called it Burma’s Devil’s Triangle. Then, and only then, did I realise the enormity of my responsibility. To lose such a relic would put the friendship of nations back a hundred years and a foreign non-believer could be blamed! 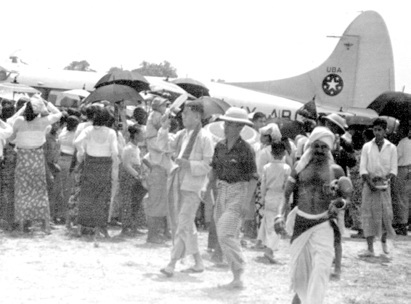 We landed at Mergui and even before the Dove’s propellers had stopped thousands of devotees swamped the plane. I mused that a spinning prop would behead a Buddhist with the same indifferent lack of discrimination as an Anglican. Dalada Maligawa, Kandy: where the Sacred Tooth Relic is kept. (Photo: Sunday Times 16 August 1998). 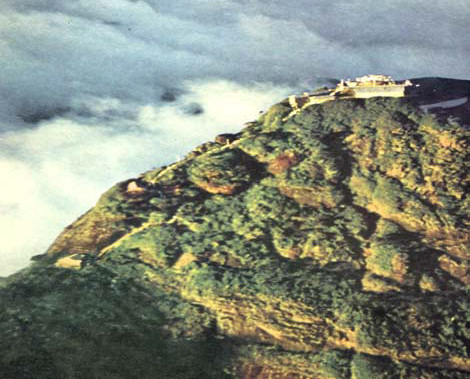 Adam's Peak which Buddhist climb to worship the Buddah's footprint enshrined at its peak. (Photo: Time-World's Great Religions). Following my touch down the DC3s of Air Burma and Cathay Pacific Airways landed. 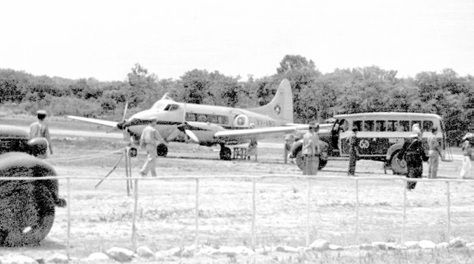 These aircraft carried the backup personnel and a 20-man group of Kandyan Dancers and their Drummers. Each day for the past 2000 year, at 11:00 hours these performers and their forebears had performed a reverential and sacred ceremony. Their dance ended with offerings of water and flowers. The dancers’ vitality and grace won the applause of the then great ballerina Anna Pavlova. She rated their dancing the most pure form in the world. That evening I called on a Burman friend, and when I told him of my day’s work he showed great interest. He knew the history of Siddhartha Gautama, the Enlightened One, who trod our earth in the 6th Century BC. The relic was taken from his funeral pyre at Gaya in northern India, and in 483 BC, a Kalinga princess smuggled it from India secreted in her hair. 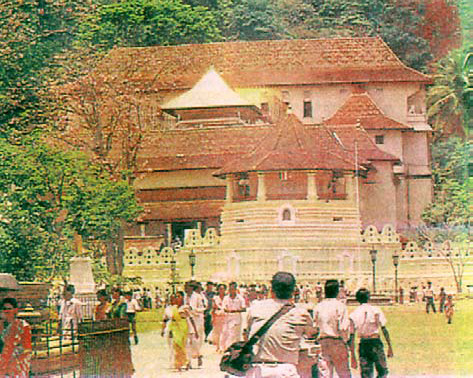 Its custodians moved it around until its enshrinement in its final resting place - the Temple of the Tooth in Kandy. The area around Kandy is rich in religious belief. Not far to the south rises a 7360-foot (2243-metre) mountain - the mysterious Adam’s Peak that links many of our great faiths. We read that Adam and Eve were driven from the Garden, but where did they go? Did they make their second Eden on that mountain? Some believe they did! At its crest is a deep depression that resembles a giant footprint. Did the Lord Buddha step there? My Buddhist friends assure me that he did! The Hindus venerate it as Shiva’s Peak, Christian’s link it to St. Thomas the Apostle. Why do countless white and yellow butterflies return to its slopes? Is it merely to die? How easy to ask questions – how hard to get worthwhile answers! 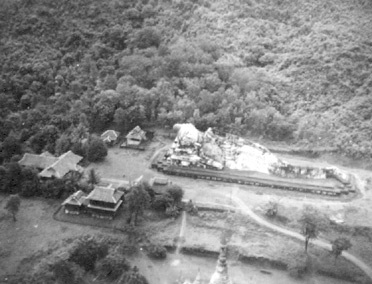 6 March 1950 Mergui Burma. Dove XY-ABQ waiting to take the Tooth Relic to Tavoy. The Reclining Buddah in inaccessible country between Mergui and Tavoy. I told my friend that I would see the relic on the 6th, but he smiled saying that was unlikely. He assured me that privilege was reserved for Sons of Kings and a few Buddhists with high connections. In my boorish manner I replied that not only would I hold the domed container but be photographed looking at the relic. He merely gave a sympathetic smile. At the crack of dawn on the 6th I thrust take-off power to my Dove. I must have been a little brutal for the sudden screech woke up my splendid radio officer Hla Pe who gave me a look of reproach. We arrived at Mergui to a deserted airfield. A traffic man guided us to a position behind a wire enclosure and quickly closed the entrance. In a few minutes the crowd that had accompanied the relic to the airport surged against the fence. The police cleared a path for the relic and its guardians to approach the plane. They began to board the Dove. A traffic officer rushed to the plane to get the Chief Guardian to answer an urgent phone call. I approached the second in command guardian and asked to see the relic. He told me the Chief Guardian had told him to show me the relic but not until I asked. As he handed me the golden container he raised its dome. He gave a little snigger as he said that I must not be photographed looking at it. It seemed everybody knew of my plans! The relic was of burnt ivory, further yellowed by age, about two inches long and an inch in diameter. It seemed more a tusk - the Gautama was not only massive in belief but in build. Yet, what did I really see? The Portuguese claimed they removed the relic when they occupied the country and any authoritative sources agree they did! If this is so did I merely see a counterfeit? 6 March 1950 Tavoy Burma. The devotees receive the Tooth. R/O Hla Pe befriends a Kandyan dancer. inaccessible spot south of Tavoy. Our arrival at Tavoy proved a repeat of the Mergui fiasco. Again the spinning props behaved themselves avoiding the masses of humanity that pressed on every side. With the passing days that great honour gradually slipped into the archival part of memory, but such wonders insidiously await recall. About 50 years later I was in Hong Kong to help close down the fabulous Kai Tak Airport. A phone call, in answer to a fax, brought me to the Kowloon Cricket Club. There I met a splendid fellow named Roger Thiedeman, who is a valued contributor to several newspapers. He interviewed me and in the fullness of time this article appeared in the Sri Lanka Sunday Times. When he submitted the feature it carried the title THE PIRATE AND THE TOOTH RELIC. His editor thought pirate was somewhat questionable for a religious story. Naturally, the editor won, but, was Roger the more perceptive? Printed & Published by Wijeva Newspapers Ltd. 16 August 1998 at No. 8 Hunupitiya Cross Road Colombo 2 Sri Lanka.